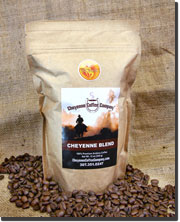 At Cheyenne Coffee Company we sell many varieties of the finest coffee available. In addition to choosing whole bean or ground, you can also select your preferred degree of roasting. Our lined, kraft packaging with an air valve ensures your product stays fresh from our roasting room, to your door, to your cup! Need large quantities of coffee for your business or organization? See our Wholesale page. Click here for a PDF version of Our Coffee brochure! Our special signature blend. Smooth, perfect all day long. Flavor is soft and mild with a slight nuttiness. Low acidity. Bolder than our Cheyenne Blend. A great start for your morning. the decaf lovers. This premium coffee comes from the Tarrazu region. You will find subtle chocolate undertones with a hint of citrus. A wonderful African coffee. Rich, full body and a nicely balanced acidity. One of the world's finest traditional coffees. Grown without chemicals in the high mountains of Indonesia. Bold and full flavored. Shipping within the continental U.S.
All shipping/receiving on Monday - Friday, excluding holidays. Not sure? Let us pick what we think is the best roast for your coffee. Order your coffee online, by phone, or by mail.